I ordered fabric for my setting blocks over a week ago, and it still hasn't arrived. Hopefully it'll come today and I can get started on them. Just passing through and saw your quilts. They are amazing!!! Wish I had that talent. I enjoyed looking at them. what did you decide to use for the setting blocks? oooh it's so orange! love it. can't wait to see the fabric for the setting blocks. I still haven't decided on color, so I ordered some blue and gree (Katie Jump Rope), and we'll see what I like best with all the stars. 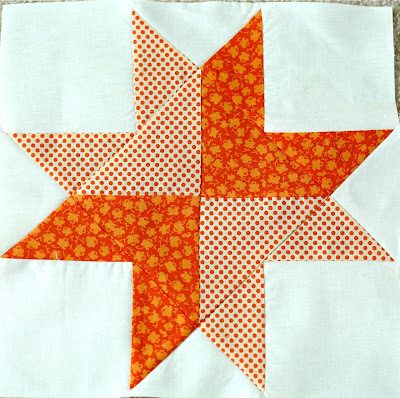 LOVE your orange stars. They came out fabulous! 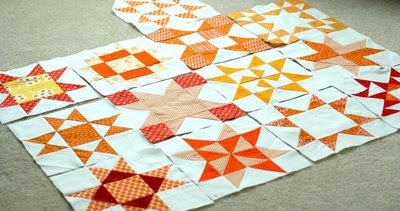 I adore the orange and you've got my favourite wee play fabric! I want to buy bolts of that - it looks gorgeous in every colourway and goes with everything! Great job on the stars!